Sheffield United’s Daniel Lafferty hopes a good run of form at club level will earn him a recall to the Northern Ireland squad. 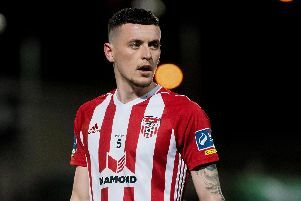 The former Derry City favourite, who just missed out on a spot at Euro 2016, is enjoying life with the Yorkshire men and concedes getting back into Michael O’Neill’s set-up would be ‘great’. “It would be great to get back in, but to be honest it hasn’t been in my mind in recent months,” stated Lafferty. “Trying to get into the Northern Ireland squad it’s as hard as it has ever been, but if playing here and reguarly performing well merited a call-up then it would be fantastic. “We are playing some nice attractive football, we are scoring goals and have got some very good players at Sheffield United, but we are just over the halfway point now. Lafferty, 27, has been operating in a wing-back role for the League One leaders this season. “I think it was the Gillingham game away the manager threw me straight in and tried something new,” he added. “He went with a 3-5-2 formation, at times we play as a 3-4-1-2, so yeah it’s a bit of a graveyard shift, it can be a bit hard on the legs and lungs, but it’s actually a very enjoyable position. “Obviously myself playing as a full-back I would be looking to get up and down anyway, so it doesn’t really change your game much, it actually gives you a little bit more licence to get forward. “Yes it is a bit gruelling, as one minute you are defending your own back post and the next minute you are looking to attack their back post, but because things have been going so well and we have got so many good players in the team, it’s a very enjoyable formation to be playing in. The talented defender signed a two-and-a half year deal with the Bramall Lane out-fit after moving from Premier League side Burnley. Now he wants to help the ‘Blades’ win the League One title and with it, promotion to the Championship. “It has been brilliant to have joined a club who have been successful so far this season and I’m delighted to have signed the deal,” he added. “I have started in every league game to date this season and it has been great to play my part in it, I think I have been involved in one defeat in 22 games that I have played, so yeah, it’s very enjoyable when you are part of a club that is being successful on the pitch. Lafferty admitted he didn’t appreciate how big the club was until he started to play for the Blades. Over the Christmas period United have had over 50,000 supporters watch their two home victories over Oldham Athletic and Northampton Town. “In two games alone over Christmas, we had over 50,000 people. No one else in this league does that, not even teams in the Championship do that. “Sheffield United is a huge club. I didn’t realise just how huge until I actually came here and saw it for myself.